Ursula and Jim took advantage of a run of splendid summer weather earlier this week to hike up to Madison Spring Hut. We’ve been tracking renovations to the nation’s oldest mountain hut since work started last fall. Jim had some work to do up that way, and Ursula needed to break in new hiking boots before her Teen Wilderness Adventures course starts next month. Ursula wasn’t sure she wanted to give up one of the first unscheduled days she’s had this summer vacation. Circus camp had followed theater camp, which had started immediately after school ended. But the chance to spend uninterrupted time with Jim and the promise to dally in mountain streams on the way back down made the difference, and she was up and ready to go before first light. By late morning, they were hiking in from the north, off Highway 2. Ursula started out in comfortable school shoes, her new boots tucked in her pack. Numerous trails head up the northern slopes of the Presidential Range. Ursula helped Jim follow the signs for Valley Way, the easiest and most direct trail to the hut, and the most sheltered approach in poor weather. None of that was anywhere in sight, although less than a week earlier, severe thunderstorms had pounded the White Mountains. What was in view much of the way up were other hikers headed for the hut, many of whom were also eager to see its new look. Four miles and 3,500 feet in elevation gain later, they stood before the hut. The first hut below Mt. Madison, built in 1888, was a modest stone affair that slept 12 hikers. The “new” hut uses part of a larger 1929 footprint and some of its stone walls, but opens up into an entirely new dining room and refashioned sleeping spaces. Inside the new dining room, big windows below a soaring cathedral ceiling looked north and west. Jim and Ursula ate a late lunch in front of those views and then headed back down the mountain, Ursula now in the new boots. Jim had no trouble keeping to his promise, pulling out his fly rod at each deep hole in Snyder Creek. (A fisherman to the core, he won’t let me divulge any details in print.) Ursula waded in, hiking shorts and all, and left the trail for short sections and followed the stream instead. The last mile or so, she didn’t even bother to put her boots, or her socks, back on. 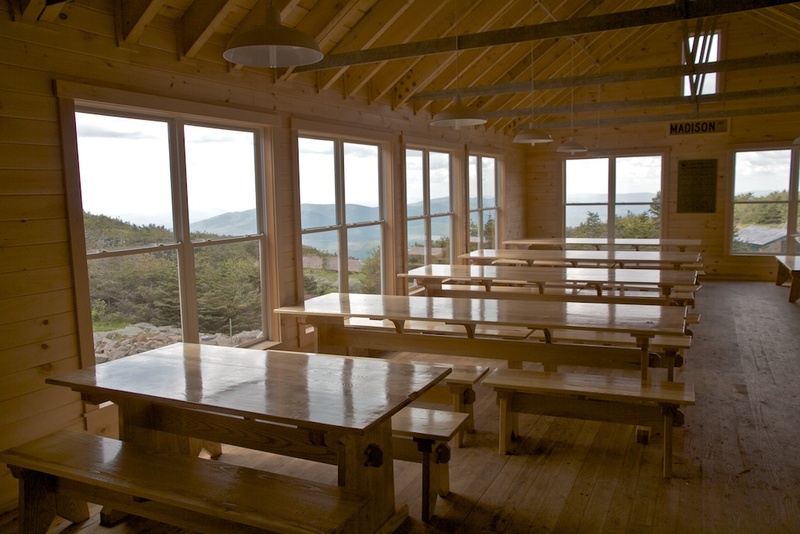 - Read about the Madison Spring Hut renovation and re-opening. 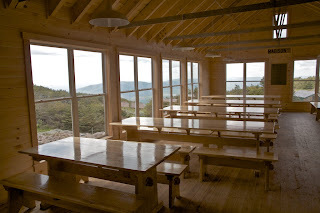 - View a time-lapse video of Madison Hut history and its recent renovation.